Eggs may have received a bad rap in the past, but research is beginning to show just how good they are for you. The "American Journal of Clinical Nutrition" found no evidence between people who eat eggs and heart attacks. However, the Harvard School of Public Health still recommends no more than 3 eggs each week to avoid other health risks. 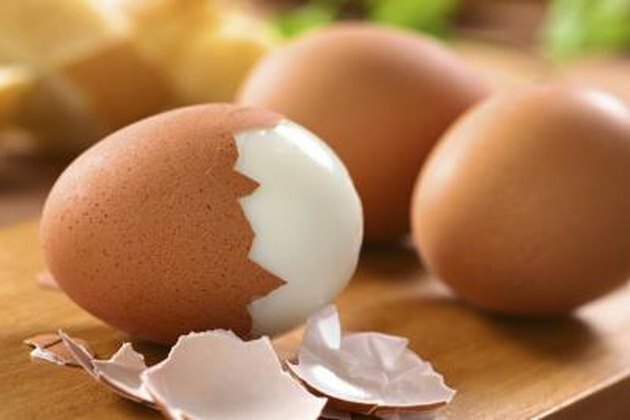 You can eat your eggs in many ways, but boiling is a simple way to create a healthy snack that can be taken on the go. Boiled eggs are also easy to pack in kid's lunchboxes, or can be stored away in the refrigerator for later snacking. Health diaries suggests that eggs are especially beneficial to the eyes. Eating one daily may prevent macular degeneration, because eggs contain the nutrients lutein and zeaxanthin. These nutrients are found in eggs more than other food sources. Consuming eggs may also lower the risk of cataracts. Eggs also contain a high sulfur content and are a good source vitamin D, along with other vitamins, minerals and antioxidants. This helps grow healthy hair and nails. Eggs may be good for brain function since they contain choline. Choline is a nutrient that regulates the brain, nervous system and cardiovascular health. It helps maintain the structure of brain cell membranes, which helps relay messages from the brain to nerves and muscles. It also helps pregnant women with fetal brain development and prevents birth defects. Eggs are a quality source of protein, and are known to be the highest source of all food sources. Protein helps give your body energy and makes you feel full longer. Eggs are also low in saturated fat and can be considered a lean protein, as they contain only 70 calories each. Lean proteins are a vital component to weight management, when accompanied by fresh vegetables and whole grains. Eggs may also help build muscle strength and prevent muscle loss. Does Eating Eggs at Night Keep You Awake?